Don’t let unnecessary accidents get in the way of fun Halloween festivities. Following a few simple Halloween safety tips can keep kids safe and ensure your celebration doesn’t end with a frightening experience. First on the list of Halloween safety tips for kids, pumpkin carving should always be left to an adult. Young children can be allowed to draw the face on with markers, but should never touch or handle sharp knives. To prevent a possible fire, light your carved pumpkins with glow sticks or flashlights. If you must use a candle, opt for a safer, votive type. Any candlelit pumpkin should be placed on a sturdy table, away from flammable items such as curtains and tablecloths. Keep your pumpkin in a place where it’s unlikely to be knocked or tripped over, and never leave a candlelit pumpkin unattended. The following Halloween safety tips for parents can help to create a welcoming atmosphere for children. To ensure Halloween safety for kids, make sure your yard is safe, well lit, and inviting for trick-or-treaters. Remove any debris that might cause tripping, such as hoses, lawn care items, toys, and bikes. Replace any missing bulbs in outdoor lighting. Clear away wet leaves, ice, or snow, and keep your pets well-restrained. While costumes are a traditional part of the Halloween celebration, they can be dangerous without proper precautions. Choose well-fitting, flame resistant costumes, footwear, and accessories. Poorly fitting items can create obstacles that lead to falls or injuries, such as sprained ankles or strained muscles. Avoid decorative contact lenses which can cause pain, inflammation, infection, and even serious, permanent eye damage. Avoid accidents by making sure any objects that are part of the costume—such as swords, knives, or canes—are soft and flexible. Make-up should be pre-tested on a small area of skin in advance to prevent any unpleasant skin reactions. For better visibility, and to keep children safe from traffic, consider adding reflective tape to costumes and treat bags. Masks and other costume elements should never block eyesight or limit vision or movement in any way. Make sure older children understand Halloween safety rules if they are bringing costumes to school. 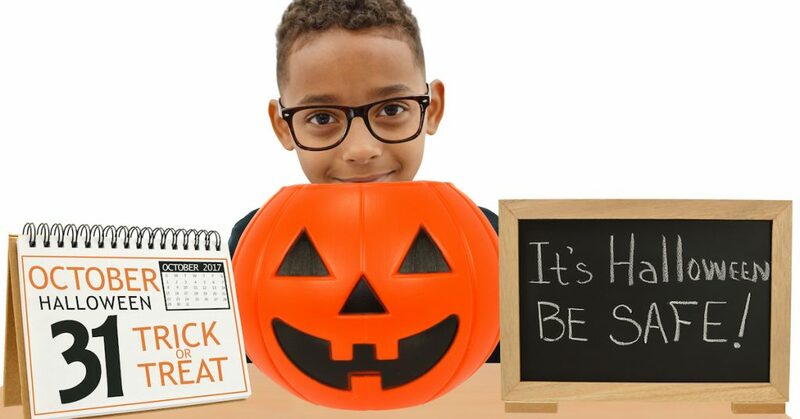 Following these trick-or-treat safety tips is essential for a good time this Halloween! Pedestrian injuries are all too common among children on Halloween. To avoid lurking dangers, young children should always be supervised by a responsible adult when trick-or-treating. Older children should trick-or-treat in groups, follow an agreed-upon route, and return home at a pre-designated time. Trick-or-treat in familiar neighborhoods and travel along sidewalks whenever possible. In areas with no sidewalks, walk along the far edge of the road facing traffic. Do not cut across yards or through alleys, and use only established crosswalks. Always look both ways before crossing the street. Never just assume a driver has seen you. Halloween safety tips for parents can help create a better experience for all participants, especially when trick-or-treating. For greater visibility and safety while trick-or-treating, both children and adults should carry flashlights with fresh batteries, stick to well-lit streets, and only visit homes with a lit porch light. Make sure children know never to enter a home or car for a treat. Carrying cell phones can be a great way to keep everyone connected. In extreme cases, these can also be used to call 9-1-1 in an emergency. Everyone in your group should agree on the Halloween safety rules and act accordingly. Halloween safety for kids is very important when thinking about the treats kids will receive. Children who eat a good, healthy meal beforehand will be less likely to overindulge after trick-or-treating. As soon as children return home, carefully inspect all treats for signs of tampering, and throw out any unwrapped, spoiled, or suspicious items. Establish a rationing plan for the remaining treats, spreading them out over the coming days and weeks. You might also consider giving children the option of trading sweets for non-food items, such as coloring books, stickers, or similar toys left by the “Treat Fairy.” These also make good substitutions for candy when handing out treats to kids who visit your home. For children with food allergies, it’s important to carefully check all food labels for ingredients that could trigger a life-threatening reaction. If labels are missing or unclear, discard the item rather than risk an adverse reaction. Be aware that even miniature candies with no listed allergens may contain small amounts. This is because factories sometimes produce these smaller, seasonal candies on equipment normally used for items containing other ingredients. FastMed wishes everyone a safe and happy Halloween. If you should require care for an accident or injury, we’re here for you at over 100 locations throughout Arizona, North Carolina, and Texas. No appointment is ever necessary. Just walk in, or check in online first to save time.